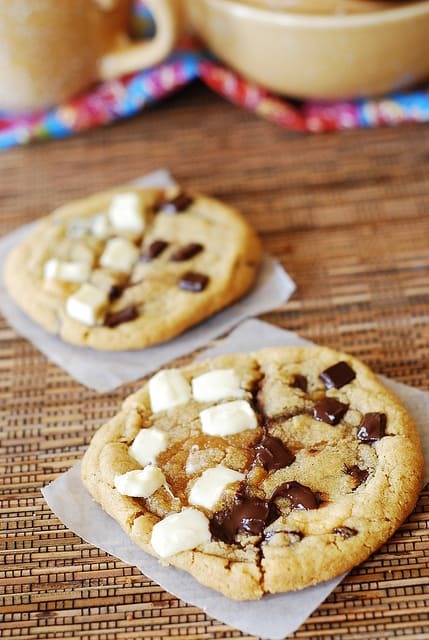 Chocolate chip and white chocolate chip cookies – 2 types of cookies in one! I really liked this recipe for soft and chewy chocolate chip cookies, so when I ran out of them and wanted more, I decided to make them the way I actually prefer to eat my chocolate chip cookies: with both regular chocolate chips and white chocolate chips (or chunks, as you see in these photos). 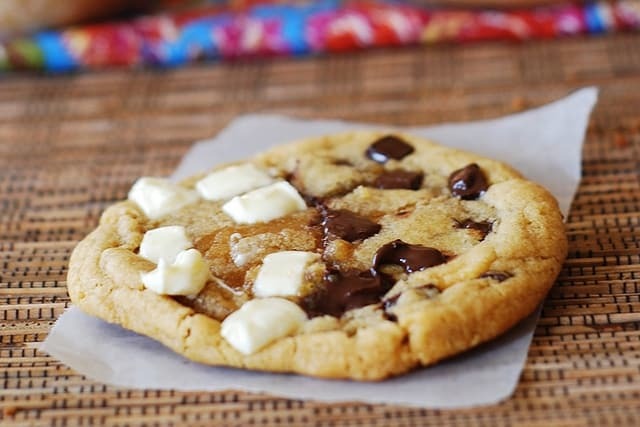 Combining both white and regular chocolate chips in one cookie, but strictly confining them to different sides of the cookie – to me, that’s two cookies in one! 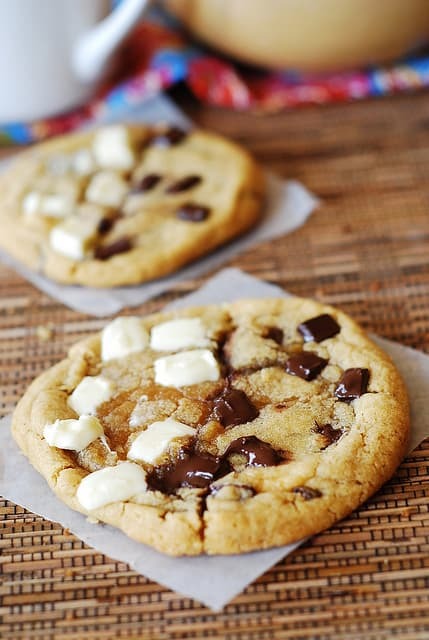 I love biting the semi-sweet chocolate chip side of the cookie and enjoying all that rich chocolate flavor (along with a cup of hot tea), and then biting the white chocolate portion of the cookie – the contrast and the balance of the flavors is amazing! You can also easily half the recipe. Combining both white and regular chocolate chips in one cookie, but strictly confining them to different sides of the cookie – to me, that’s two cookies in one! One of my favorite cookie recipes! Using electric mixer, in a separate bowl combine the butter with both sugars. (The butter should be soft at room temperature, but it should not be liquid – do not use microwave, let the butter sit for an hour). Beat butter and sugars on medium speed until light and fluffy. Add the salt, vanilla, and eggs and continue beating on low speed. Beat until mixture is light, fluffy and very creamy, about 1 minute. Add flour mixture; mix until just combined: do not overmix. Divide cookie dough into 2 equal batches, place each batch of cookie dough into a separate bowl. Stir in the regular chocolate chips into one batch, and stir white chocolate chips into the second batch of cookie dough. Leave out some chocolate chips of both colors – for putting them on top of cookies. 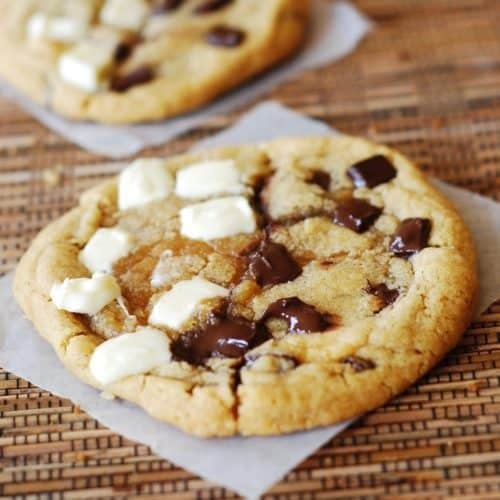 Combine a spoonful of cookie dough with regular chocolate chips with a spoonful of the cookie dough with white chocolate chips – to form tablespoon-size flattened ball of cookie dough and drop it on baking sheet lined with parchment paper. Repeat, placing cookie balls about 2 inches apart. Bake until cookies are golden and set around the edges, but still soft in the center, 8 to 10 minutes. Midway through baking, pull the cookie sheet out, and add more chocolate chips of respective color on each side of each cookie. Put the cookie sheet back in the oven and continue baking. The softer you want your cookies to be, the less amount of time you should bake, that is, no more than 8 minutes. Cookies will still look like they are not set in the middle – that’s OK. They should not be golden brown on top. Once removed from the oven, they will continue cooking for a little bit. it took me a lot longer than 10 minutes to bake them. first recipe trying on your website and i LOVE it!!!! cant wait to try more recipes! i made mine a little big and they came out like bigger than my hand but its awesome and makes me feel like im in a cookie advertisement!!! Hi Irina, I am glad you liked the cookies! 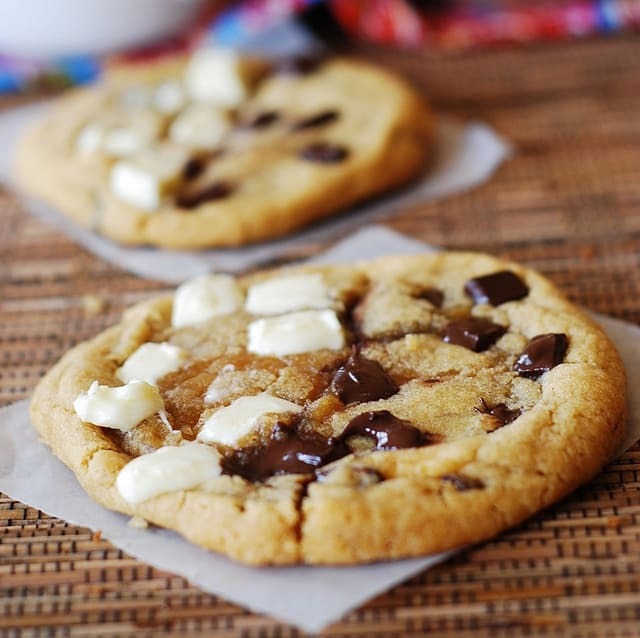 This is a very good, basic cookie recipe and I love using both white chocolate chips and regular chocolate chips at the same time, in one cookie! And, The bigger the cookie – the better! Gosh, great combo of flavors! Love the way these look – half & half cookies! Good stuff – thanks. Love that you kept the chocolate chips and white chocolate separate. Yum! I might just have to make these. I am all of a sudden craving cookies. These really do look marvellous and those choc chips that are still melty. Oh my! It’s been so long since I’ve made chocolate chip cookies, but now I am craving them. These look so chewy and delicious!